This post is about the Charyn canyon and the Kolsai lakes and includes a travelguide on how to get to the Charyn Canyon and Kolsai Lakes as an independent traveller. The Kolsai lakes and Charyn Canyon are some of the most beautiful places to see Kazakhstan’s incredible nature and they are relatively easy to visit from Almaty. Almaty is heaven for the outdoors enthusiast. Wherever you are in the city you will see the mountains waiting for you. The snow-capped peaks of the Tien Shan promise a wilderness where bears and snow leopards still roam around. I am not a city person and I constantly felt an itch to explore Kazakhstan’s countryside. Most of Kazakhstan are steppes of which I had seen enough from the trains. But Almaty lies in a small corner, bordering Kyrgyzstan and China, with some of Kazakhstan’s most diverse landscapes. As a solo backpacker it is unfortunately not easy to travel around. Public transportation is limited, distances are long and the roads are not the best. Just before I left for this trip Kazakhstan made it to the the dutch version of the World’s most dangerous roads. They drove to the Charyn Canyon and Kolsai lakes. Exactly the places I wanted to go to. On internet I found stories of couples that went on adventurous journeys with a combination of shared taxi’s and hitchhiking. If I had a partner in crime I would have been up for this as well, but as a solo female traveller I decided to play it safe. My hostel offered a tour in the weekend to both the Charyn Canyon and the Kolsai lakes. Kazakhstan’s episode of Worlds most dangerous roads on the dutch television was no joke. There was not much traffic, but what was there had difficulties driving in a straight line. Too much vodka, maybe? The gas station sold no snacks, but had an extensive collection of alcoholic drinks that were cheaper than water. The fancy cars you see in the cities are nowhere to be found outside of Almaty. The countryside is like a museum of old lada’s and tractors who barely survived the Soviet times, some of them not able to drive more than 30 kilometers per hour. Besides slow vehicles to watch out for there is also the occasional loose horse, sheep or cow running around. Out of Almaty the road deteriorates. While our driver tried to avoid holes and cracks we had a few near accidents. The scenery is beautiful tough with rolling hills changing colours as the sun and clouds play their games in the sky. From green grasslands to red sandstone and barren deserts. My companions were a russian driver, a german police detective, 2 english girls studying Russian, an italian birdlover and his french wife. Igor our driver spoke no english, but wasn’t very talkative in general so this didn’t really make any difference. After 3 hours of driving we reached the Charyn Canyon. 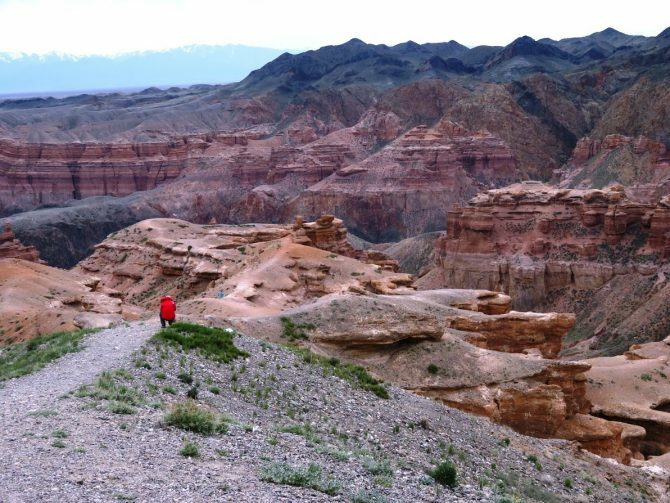 For millions of years winter and water eroded Charyn’s red sandstone in impressive shapes and rock formations. The canyon is about 90 kilometers long and even tough it is smaller than the Grand Canyon it is no less impressive. We walked through the Valley of Castles. A pleasant hike of 4 kilometers with new views around every corner. It didn’t feel like Kazakhstan to me and it was so different from the grasslands above us. The signs in cyrillic and bad english were the only proof i was not in the Grand canyon. From the red sandstone and the rolling grasslands we drove higher up in the mountains untill the paved road came to an end. Our jeep struggled as we crossed several streams and rivers on our way to Kaindy. An eery alpine lake with dead trees sticking out. The lake evolved after an earthquake in 1911 that caused a landslide forming a natural dam. The forest submerged of which the trunks still rise out of the water like spears of a hidden army. After the adventurous road to Kaindy Lake we reached the small village of Saty where we would stay the night. A collection of small wooden farmhouses surrounded by green meadows and forests of pine trees. The gardens were full of old Russian tractors and farmtools still going strong, although the main mode of transport in the village was the horse. The host in our homestay was a 76-year-old lady who was once a gynecologist. The rest of the evening she showed us all the pictures of her family. The next day we woke up early for our hike to the Kolsai lakes. It was drizzling outside, but that did not take away the beauty of the first lake. It was an 8 kilometer hike to the second lake. Dressed in a rain poncho and an umbrella I was ready to go. The drizzling turned into rain, but the scenery of the dense pine forests and streams kept me going. It was a gradual climb and sometimes the snowcapped peaks became visible in the distance. But the higher we got the more muddy and slippery the path became untill we had to walk through snow and ice. The second lake was still nowhere in sight so we decided to turn back. It was a bit of a dissapointment that we did not make it to the second lake, even tough we were almost there. Some of us who did not bring rain gear were soaked to the bones. After a hearty lunch of laghman we said goodbye to our host family and prepared ourselves for the long journey back to Almaty. I enjoyed every minute of the spectacular views along the way. The real beauty of Kazakhstan is not in the futuristic buildings and show off parks that Nazarbayev builds in the cities, but in the vast wilderness outside. You can visit The Charyn Canyon and Kolsai Lakes on a tour or independent. To go on your own is not easy, but it is possible. It requires time tough and patience and involves a combination of hiking, shared taxi’s and hitchhiking. There are several companies offering cheap day tours to the canyon, especially in the weekends. Take into account that it can get pretty busy in the valley of castles with these tourgroups and they will only give you enough time to do the 4 kilometer hike through the valley of castles. If you want to go on your own you can take a shared taxi to Kegen/Saty and ask them to drop you at the turn off for the Charyn Canyon. From there it is a 12 km hike through the grasslands, without any shade, to the entrance of the Valley of Castles. To get back you have to hike the 12 km back to the main road and then hitchhike a ride back to Almaty. If you go on your own you can consider to stay overnight in the canyon. At the end of the 4 kilometer walk through the valley of castles there is an ecopark with a restaurant and accomodation. I would definetly recommend to stay there and explore more hikes throughout less visited parts of the canyon. To see the Kolsai lakes you need at least 2 to 3 days. From Almaty there is a bus at 6 AM to Saty, but the service is not very reliable. If you miss the bus you can take a shared taxi to Kegen. From there you can use your hitchhiking skills to catch a ride to Saty. For more information you can read the detailed description of travelbloggers who managed to get there independently on Lost with a Purpose and travels of a bookpacker. Saty offers plenty of homestay accomodation options where you can sleep and eat for around 3500 tenge per person per night (including food). They can also organise your transport back to Almaty on the 5 am marshrutka. There is no bus station, but you will need to inform the driver and he will pick you up. Kaindy lake is probably the hardest to get to on your own as there is no public transport. You can go to Saty, but it is still quite far and the road is in a rather bad condition, especially if it rains. In Saty you can arrange a taxi to Kaindy lake. I organized my tour with Almaty Backpackers Hostel and had a great time. I can recommend them both for accomodation and booking tours. They also offer day tours to the Charyn Canyon, Big Almaty Lake and multi day tours to Altyn Emel National Park. Read more on Almaty in the best of Almaty : the heart of Kazakhstan. The season runs from May to October and summer is the best time to visit. In winter it will be very cold and it is not advisable to hike to the lakes. I was there in April when there was still snow and ice on the trail. The hike was very muddy and slippery because of melting snow and therefore we didn’t make it to the second lake. Because Kolsai Lakes are in the mountains you can expect any kind of weather and even in summer it can get cold in the evenings. Although proffesional hiking boots are not necessary, the trail to the lake can get muddy and slippery and requires a good pair of shoes. Mosquitoes are plentiful in summer, especially around the lakes. There are no ATM’s in the Charyn Canyon and the Kolsai lakes so make sure you bring enough money with you. Even though there is a simple restaurant in the Charyn Canyon and a basic general store in Saty it is best to carry some snacks with you. Kazakhstan looks amazing. It reminds me so much on Mongolia. I’ve always wanted to go and explore the mountains in Kazakhstan! Your photos have reinforced this dream. Really interesting post and experience. I don’t know much about Kazakhstan, but it looks beautiful. This is awesome! I went on a Silk Road overlanding trip this time last year and we only spent four days in Kazakhstan. I feel like I missed out on so much and definitely want to go back and explore more…despite how difficult it seems. Your pictures are beautiful . What I would do for some laghman right now! This is all kinds of awesome! This country has been high on my bucket list, but logistically, I couldn’t make it happen during my massive year long European/Asian tour. But yes, I have been quite curious about Kazakhstan and your blog has some great well-organized and well-detailed points that I’ll be sure to keep in mind! Thanks so much for all the information, can’t wait to go there.